We are happy to present our bases in Italy giving you opportunity to experience the best that this beautiful, romantic country has to offer. Our bases (Procida, Sardinia, Sicily and Tropea, at the tip of the foot) are positioned perfectly to visit Roman ruins, stare in awe at Renaissance art, relax on stunning beaches and dine in a variety of delightful restaurants. Whether for a week-long tour with friends and family or a romantic getaway, we have the boat to accommodate your needs. Snorkeling, fishing, shopping, night life, romance, fun... something for everyone is awaiting. The coast of Italy offers both historical and natural delights. Fishing, shopping, night life, romance, fun... Visit the villages to try some of Italy's delicious cuisine. Visit Roman ruins, relax on stunning beaches... Sail along the breathtaking ragged coasts. Experience the best that this beautiful, romantic country has to offer. ITALY BAREBOAT CHARTERS - The ultimate in privacy & freedom, bareboat rentals are for groups having their own qualified skipper. Hiring a captain and or hostess/cook always remains an option. For a list of our available Bareboat yachts, please Click Here. Italy is a joy to discover, its dreamy light and sumptuous landscapes seem made for romance, and its years of experience in history, culture and delicious cuisine seduces just about anyone who goes there. Visit beautiful old towns and ancient ports and cruise some of the sunniest and most romantic coastlines in Europe. You will be amazed at the views as you sail through these lush waters past the rocky coastlines, beautiful castles that you can explore. The climate here is Mediterranean, with hot dry summers and mild wet winters. The sheer height of some of the larger volcanoes and mountains cause a sharp difference in climate. On the coast the average temperature is around 19˚C, which is likely to drop to around 13˚C inland. Portorosa Base in Tonarella:Situated in the Portorosa Complex, the Marina di Portorosa is a prime location for the start of a Sicily yacht charter. There is two airports in the area of the marina, both about a two hour commute to the base. Reggio Calabria Airport requires a drive and a ride on the Villa San Giovanni-Messina ferry. Taxis and other transportation are available at the airport. The other airport is the Catania–Fontanarossa Airport or also known as the Vincenzo Bellini Airport. It is an international airport 2.3 NM southwest of Catania, the second largest city on the Italian island of Sicily. Naples Base (Pozzuoli):The largest city in southern Italy, Naples has one of the world’s largest historic centers and is famous for its UNESCO World Heritage status. With a Mediterranean climate and warm waters between May and October, it’s also a prime spot to sail the Amalfi coast, Capri and the many outstanding nearby islands. From Sorrento to Positano and Ischia to Ponza, this historic coast and archipelagos will enthrall and entertain your crew with nature reserves, delicious Italian food and traces of ancient civilizations. Our new base is in Pozzuoli, which has a charming ambience and mountainous backdrop. From here you have the perfect platform to explore the city of Naples and its Italian atmosphere along the old town’s Spaccanapoli, the famous long street that divides the city. Procida Base: The Isle of Capri, its name summons images of the Mediterranean, the storied history of the Greeks and Romans, the chic and sophisticated who routinely vacation there. The island is but one jewel in a chain extending off the southwest coast of Italy. Naples lies just to the north. Considered part of the numerous Italian minor islands, the Phlegraean and Pontine groups include Procida, Ischia, Ventonene, Ponza, Palmarola, and tiny Santo Stefano, among others. Capri, southeast of Procida, is in a class of its own. A Bay of Naples sailing vacation typically centers on the Phlegraean and Pontine islands, and the Amalfi coast on the Sorrento Peninsula, though longer cruises can take sailors south to the wonderful Aeolian Islands. Regardless of the length of the cruise, a Bay of Naples yacht charter offers a blend of magnificent sailing, upscale dining, boutique shopping, and intriguing sightseeing in picturesque towns with roots dating back to ancient Greece and Rome. Cannigione Base:Situated at the northwestern edge of the Tyrrhenian Sea, an arm of the Mediterranean 475 miles in length and 60 miles wide, The marina in Cannigione is a prime location for the start of a Sardinia yacht charter. A short sail north is the Maddalena Archipelago National Park and Marine Reserve comprised of seven main islands – Maddalena, Caprera, Santo Stefano, Spargi, Budelli, Razzoli, and Santa Maria. 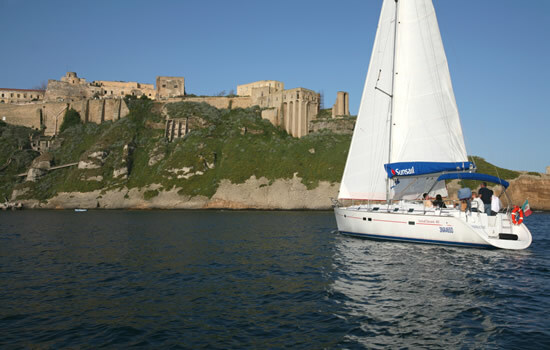 Across the Strait of Bonifacio is Corsica, France, which is sometimes part of a Sardinia sailing vacation. A Sardinia sailing itinerary takes you to Italy's stunningly beautiful Maddalena Archipelago National Park and Marine Reserve and the world-famous Emerald Coast, well known for its superb beaches and myriad coves and bays. A Sicily sailing itinerary takes you to the stunningly beautiful Egadi Islands west of Palermo, and to the picturesque harbors of the Sicilian coast.